The Spring Salon was first held in 1922, begun by students and teachers of Springville High School who wanted to exhibit and promote original artwork. The Salon has been held annually since that time, except during World War II when fuel and other goods were rationed nationwide. The Springville Museum of Art continues the tradition today and invites all artists in Utah to participate in the 95th Annual Spring Salon. This exhibition is a juried competition that showcases the diversity and quality of contemporary Utah art. Saturday, November 9, 2019— 5:00-8:00 pm. 15th Street Gallery is having a holiday group show with work from all the artists they represent. It will open Friday, November 16th from 6:00-9:00. Come for food and to meet the artists! 2018 marks the 40th anniversary of David Ericson Fine Art. To celebrate this anniversary, the 40th Anniversary Show opens on November 16, 2018 from 6-9:00 pm. It will be a fun event to recognize all of the artists, past or present, that have pushed the local art scene forward for the last 40 years at the gallery. Come enjoy food, beverages, live music and, most important, the art! Saturday, November 10, 2018— 5:00-8:00 pm. A solo show of paintings by Stephanie Hock at the IJ & Jeanne Wagner Jewish Community Center, 2 North Medical Dr, Salt Lake City, Utah 84113. Opening Reception is Wednesday, May 2, 2018 from 6:00 to 8:00 pm (free and open to the public). The show will hang on the second floor gallery until Thursday, May 31, 2018. We will celebrate the 30th anniversary of this event in March which will be our 90th year providing home healthcare to Utah citizens. Art & Soup 2018 promises to be as amazing as the 2017 and will feature original works by 50 Utah artists along with sumptuous samplings of soups, desserts and baked goods donated by more than 25 local restaurants. Artists were selected from a variety of mediums including oil, watercolor, mixed media, glass, sculpture, ceramics, jewelry and more. Participating artists donated 30% of their sales to the CNS Charitable Care Program. The 100 Dollar Show is a one-night event held annually on the first Thursday evening following Thanksgiving. Selected artists are invited to sell original works of art for $100 each. The purpose of the 100 Dollar Show is for both the museum and local artists to give back to the community by allowing them the opportunity to purchase original works of art at an affordable price. In 2017, the 100 Dollar Show will be held on Thursday November 30th from 6:30-8:00pm. by local artists. The reception for this will be November 4 from 6-9:00 pm in the Frameworks Gallery (next to RC Willey) at the University Mall. The following day the original pieces will be shipped to the Fort Union gallery to hang for the month of November. Join us for a night celebrating our artists' smaller works just in time for gift-giving season. Open for the Salt Lake City Gallery stroll late on Friday, November 18 from 6-9:00 pm. The 1-3-5 Fine Art Show will showcase approximately 25 artists and a variety of art that will be priced accordingly: $100- $300- $500. The show is hosted by the Utah Art Market and will be held for one night only, Saturday November 5, 2016 from 5:00 to 9:00 pm at the Sugarhouse Garden Center (1600 East 2100 South, Salt Lake City, UT). 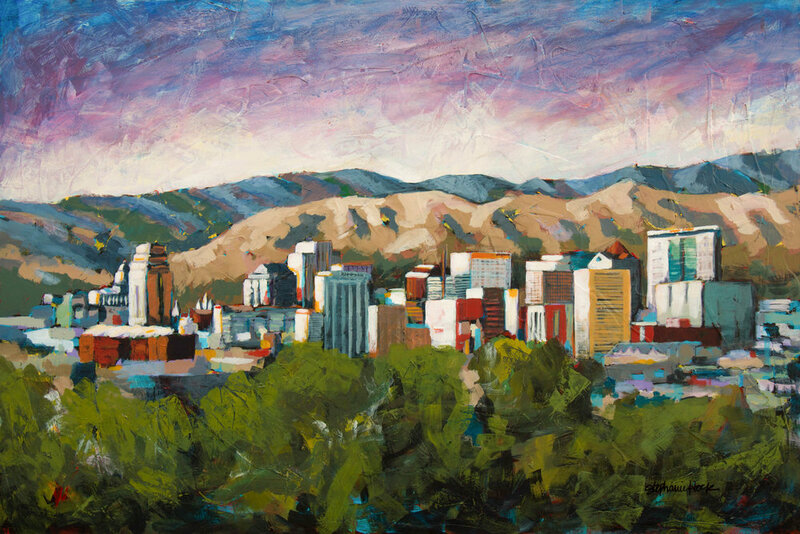 Zion Art Society Exhibition is a collection of work from emerging and established LDS artists. The group show will hang at Anthony's Fine Art and Antiques (401 S. 200 E., Salt Lake City, UT) until October 15th. You can see more about the show here: http://www.zionartsociety.org/for-artists/competition/. Look for Stephanie's painting, "Connecting" 24x36 inches.